Darren McGregor had dreamt of scoring as Hibs prepared to face his former club Rangers in a match considered a must win as far as the Easter Rod outfit’s title credentials were concerned. But when the lifelong Hibs fan did so he simply wished the earth would open up and swallow him, the wicked deflection off his left heel helping Ibrox defender Lee Wallace’s shot leave goalkeeper Mark Oxley flatfooted as it brought the Glasgow club, behind to yet another stunning Jason Cummings’ strike, back on level terms. McGregor’s dismay, however, vanished as his fellow centre-back Paul Hanlon rose to power home a header from man of the match John McGinn’s corner 17 minutes from time, his goal trimming Rangers’ advantage at the top of the Championship table to just five points and ensuring the title race is well land truly on. While it may appear harsh the goal was credited to McGregor rather than ex-Hearts player Wallace, but the 30-year-old sighed: “As a defender you just have to take it and get on with it. It’s deflating, there’s no time go get your bearings in that situation but it’s gone 1-1, they are back in the game and you have contributed to the goal. Finding themselves back on level terms to a team which had won the its opening 11 league games provided, as McGregor admitted, a test for the players but one which they rose to in style. Former Cowdenbeath and St Mirren player McGregor said: “I thought we showed great character to come back and win the game because at 1-1 they had a few chances, they were piling on the pressure, we were sitting deeper and deeper and there’s that thought at the back of your mind that they might get another. And then Paul pops up with a great header to win it. Having played his part in Rangers’ goal, McGregor made amends a little later when, after Oxley had made a superb save from Martyn Waghorn only to see the ball fall at the feet of Wallace again, he managed to deflect this effort onto the bar. He said: “I’ll take the plaudits for knocking that on to the bar, it hit the back of my head. “Playing against a team like Rangers you know you are gonig to be under the cosh, big Ox pulled off a fabulous save, we maybe got lucky with a couple but I thought over the piece we deserved it. “The work-rate of the midfielders, and John McGinn especially, was outstanding. They made our job a bit easier. While conscious he and his team-mates must keep winning when he returns to Paisley for the first time in the green and white on Saturday, McGregor welcomed the “distraction” of tomorrow night’s League Cup clash with Dundee United, a repeat of last season’s encounter when Hibs were edged out on sudden death penalties after a 3-3 draw. Hibs have done well over the past couple of seasons when presented with Premiership opposition in this particular competition, knocking Ross County out last year before losing out to United and, only a few weeks ago, stunning Aberdeen to set up the chance to claim a semi-final place tomorrow against the top flight’s basement club. Agreeing maximum points against the Buddies is probably the priority, McGregor nevertheless insisted Stubbs’ side want to keep the momentum going by claiming another big scalp although he warned that United, having got their first win under new manager Mixu Paatelainen – whom he knows well as the big Finn was his boss at Cowdenbeath – will arrive in Edinburgh with renewed confidence. 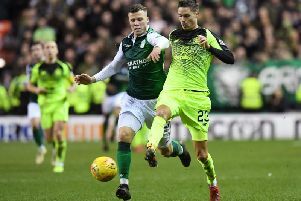 However, McGregor believes it’s another chance to strengthen the claim that Hibs are currently a club playing in the “wrong” division.” He said: “You want to test yourself against supposedly better opposition. They are in a higher league, have got a new gaffer in Mixu Paatelainen and he will no doubt have them fired up having got their first win. “We just need to prepare accordingly, to apply ourselves as we have done over the last couple of months in every single match. We have strength in depth, defensively we have been quite resolute so we just need to stick to these key components and hope that will be enough. “The league always has to take precedent, we want to build momentum and keep pressure on in it but the League Cup is an added bonus. It’s a one-off occasion you enjoy playing in and if we can do well then hopefully the fans will have a day out at Hampden to look forward to.